How to draw Anime girl face side view. In this tutorial, you will learn how to draw Anime girl face from side view. This should be easy for every artist to follow. If it is a bit too fast for you, press pause. Then you can keep drawing along. You will find video tutorial on the top. You can scroll down further to see step by step images with instruction. Learn from video tutorial with explanation and step by step tutorial. If you land on this page and you think you are on the wrong site? Hold up! No, you are not. This is “How to draw pretty much all styles and everything website” because I can. I don’t discriminate style or method. I just draw anything I want to. If you are looking for Realistic Face Tutorial, go watch How to draw female face and How to draw realistic face front view. Here is how to draw Anime girl face final image. Here is a step by step still tutorial. 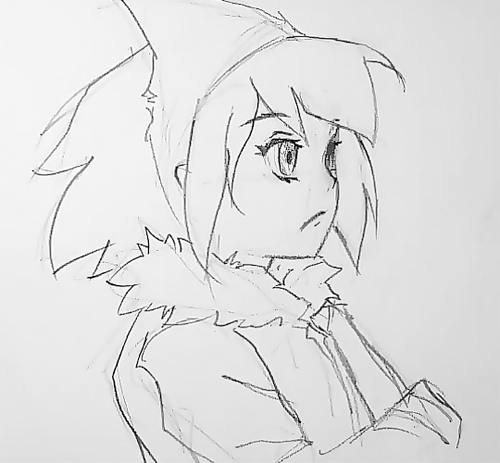 Here is a drawing for Anime girl side view quick sketch. I am going to explain how I sketch step by step. I will try to make this one as easy and simple drawing as possible. Another easy tutorial! 8) It looks fin, then I clean up the construction lines. Done! Now you have anime or manga face sketch. From here, you could tighten up the drawing more or you can go into coloring you Anime face in Photoshop or whatever you prefer.